Prize-winning artist V.M. Allen uses glass to demonstrate the changeability of emotions in this light and atmospheric painting. 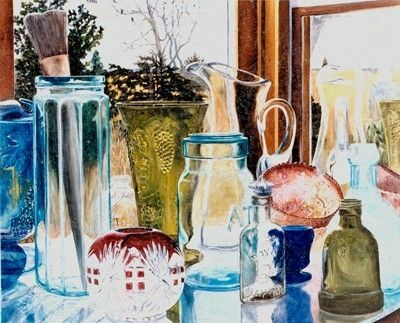 "Another Spring" shows a study of glassware in front of a window, reflected in a mirror. The objects seem to come alive and move as the day changes. This work is part of a series of twelve paintings. The artist says, "as the objects reflect changing light, I reflect on the ticking clock. They have become my metaphor for the passage of time." A Scituate resident, Ms. Allen taught at Massachusetts College of Art for over 25 years. Her works are held in public and private collections throughout the United States.